A built in Customer Center where members can download invoices, update payment details, etc. A built in Partner Center where affiliates can obtain promo tools, see approved commissions, etc. Unlimited installations of PilotPress on any WordPress website you own, membership levels and Ontraport hosted WordPress websites. Note: WordPress.com, the blogging platform, is not compatible with Ontraport. You must use a stand-alone, WordPress.org site. 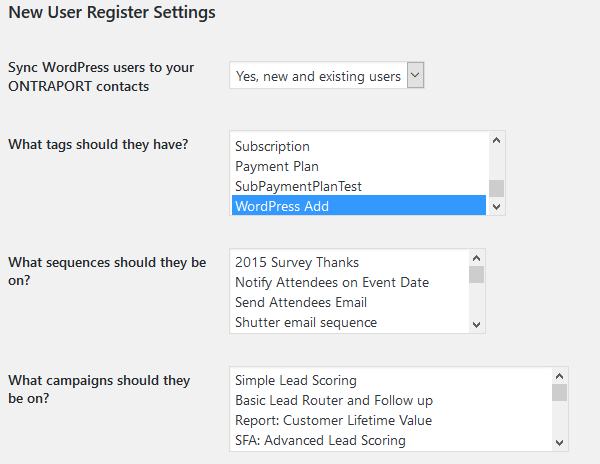 The PilotPress plugin creates a deep integration between WordPress and ONTRAPORT. Before each page loads, PilotPress checks to make sure the member has access to the page. If access to that page or post has not been granted the member is redirected to another page you select. When a member enters the Customer Center (if configured), PilotPress communicates with Ontraport to display their information and allow them to change their credit card details, view their invoices, etc. If the member is also a Partner in Ontraport they have access to the Partner Center where they can obtain the promo tools with their Partner ID information included, the sales history and commissions paid and owed. Because of the deep integration with frequent communication between your WordPress site and Ontraport, the PilotPress plugin must be the only plugin handling membership or redirection. Cache plugins must be configured to ignore the PilotPress protected pages, or they will try to render the page without regard to the protection level. 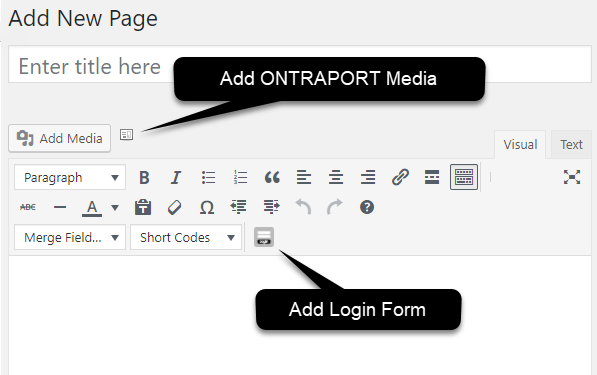 In Ontraport, you may have to turn on WordPress integration by going to the profile icon in the top right, Administration > Advanced Features > WordPress. Navigate to Administration > Integrations > Wordpress Websites. Click the New WordPress Site button, then the existing WordPress site. If you need a new WordPress site, learn more here. Name the website for reference in ONTRAPORT (1), provide the URL to your site (2), add membership levels by clicking the + Add button (3) and copy the App ID and API Key values at the bottom (4) into a text file for use in WordPress. Download the PilotPress plugin to your computer. Copy and paste the App ID and API key onto a notepad. Then, click Save in the upper right of this page. Log into your WordPress site as an administrator and install the PilotPress plugin by visiting Plugins > Add New and uploading the plugin. You will be asked for the App ID ("Application ID" in WordPress) and API Key during activation. After entering those, visit the PilotPress settings section below for further configuration. Learn more about PilotPress settings here. Application ID and API Key: Enter the information you copied from step 1 above. 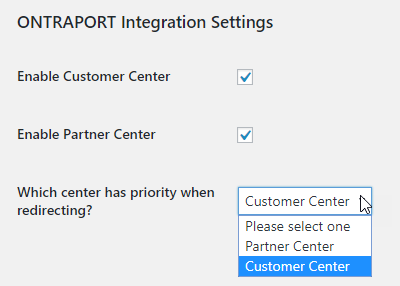 Enable Partner Center If you have a Partner or Affiliate program, check to enable the Partner Center. Your Partners can obtain promo tools, see the number of leads they have generated and track their commissions. Enable Discrete Nicknames Check this to allow WordPress nicknames to be the first portion of the email address. If you leave unchecked then it will default to FirstLast name. Note: Discrete Nicknames are only applied when the user registers for membership in WordPress first and is synced to ONTRAPORT using the New User Registration Settings below. Membership users created in ONTRAPORT will continue to have the nickname formed from their ONTRAPORT first and last name. Customers Redirect To Select the page you want to direct customers to once they log into your membership site. The dropdown menu lists all the pages you have created in WordPress, so you can use a page such as the Customer Center, membership overview page or sales page. Partners Redirect To Select the page you want to direct Partners once they log in as a Partner. The dropdown menu lists all the pages you have created in WordPress, so you can select a page such as your Partner Center, a page promoting your upcoming partner offer or one that gives an overview of how to be a successful partner. Note: Synchronization happens the next time the user logs into WordPress, so you will not see all your WordPress members appear in ONTRAPORT immediately. Because the transfer of the encrypted WordPress password has to be done during the user's login session, we cannot sync the users at any other time. Create your membership content. You have two primary options when creating your membership content. Ontraport Page. Use Ontraport's ONTRApages for WordPress plugin to add your pages to your WordPress site. Then, open any existing post, page or custom post type in the WordPress editor. A new section named PilotPress Options will be at the top right, showing the membership levels you created in ONTRAPORT. Learn more about PilotPress and the WordPress editor here. To protect entire Categories of Posts or Custom Post Types, see this article. For advanced users, see this article if you'd like to use shortcodes. Make sure all the formatting icons are available in the Visual editor when editing a page or post, and click the Add Login Form icon. If you see only one row of icons click the Toggle Toolbar icon (shown in the top row "depressed"). WordPress 5.0 will introduce the Gutenberg editor. Use a Classic block to display the PilotPress icons. 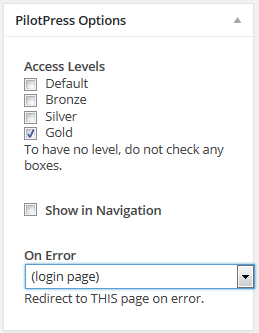 Click the Add Login Form icon, select default or Customize it. Once complete, the appropriate code will be inserted in the page. Publish the page once you're done adding a login form. For more details on creating a Login page, see this article. Connect your payment gateway so you can accept payments online. Create an Order Form to sell your Membership Product. Detailed article here. Create a Campaign to Deliver a Membership Product. Detailed article here. Test your Membership process including order form fill out and delivery of the username and password. Do NOT use the same email address as the one you use to login as a WordPress administrator or an email address that is already on your membership delivery campaign. An example of a subdomain is the URL "members.your-domain.com" where "members" takes the place of the usual "www". A folder based site would use your existing domain name with a folder name, such as "www.your-domain.com/members". I don't have the option to create a Wordpress site. Only landing pages. Thanks for your comment! We added the ONTRAPORT Basic account level after this article was written, and had not yet updated the Prerequisites section. 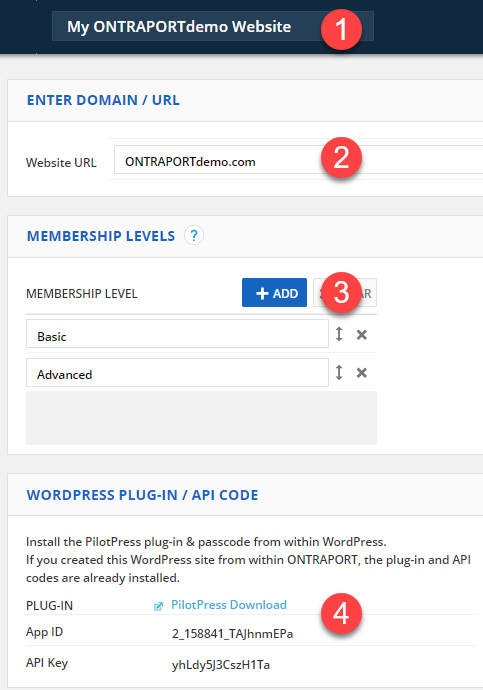 The full WordPress integration is for the ONTRAPORT Pro and Team accounts only. You can see the features for each of the ONTRAPORT account levels at https://ontraport.com/pricing (click on the blue button that says "View All Features"). Thanks for making API available in your Basic membership level. I'm hoping to fully integrate Ontraport with my WordPress website, taking advantage of the open and flexible API. Is there any way to do this? Or is the release of the API for Basic members geared more towards other 3rd party apps and not WordPress? Beyond using the Ontrapages WordPress plug-in, is there anything else I can use to connect my WordPress site with my OntraPort contacts? Is there a video or some picture examples of what the membership area can potentially look like? Hi Frank! Thanks for the information on using the PilotPress plugin to create a membership site. I can't seem to find information on the reports or analytics that we can use, to be able to see where members are at any given point. Is that available?